Home » Makeup » My Everyday Makeup Look! Let’s talk about an everyday makeup look. A real everyday makeup look that doesn’t involve nine products for each quadrant of your face. For us makeup artists who work out in the trenches with real everyday people we can see how discouraging it is for those of you who watch people whose job it is to stay home all day, apply the expensive makeup delivered for free right to their doorstep, and watch those already naturally gorgeous people take over and hour to cake on several pounds of makeup! It seems that over the last few years a lot of makeup fanatics see a picture or tutorial of makeup and think that in order to achieve that particular look they need every single product that person just used and that’s not the case. Makeup is all about creativity! At the end of the day you’re really just throwing some colors on your face to enhance what we think are our best features and maybe hide a few things we don’t love so much. How many products do we really need to feel good about ourselves everyday though? Do we need four products to get a nice brow, six creams to get even skin and nice cheek bones, or seven eyeshadows for a soft smokey eye to wear to work? Just think about Rhianna who is the image of all things gorgeous and perfect, is on tour right now, and I’m pretty sure she doesn’t have an hour for a new makeup look between every outfit change or album signing she’s going to, but she still looks jaw dropping always and forever. Its all about multi-use! Makeup artists have to be quick and efficient and we can’t carry around a ring light and a new haul from Sephora every time we bust out a glamorous face on a client. 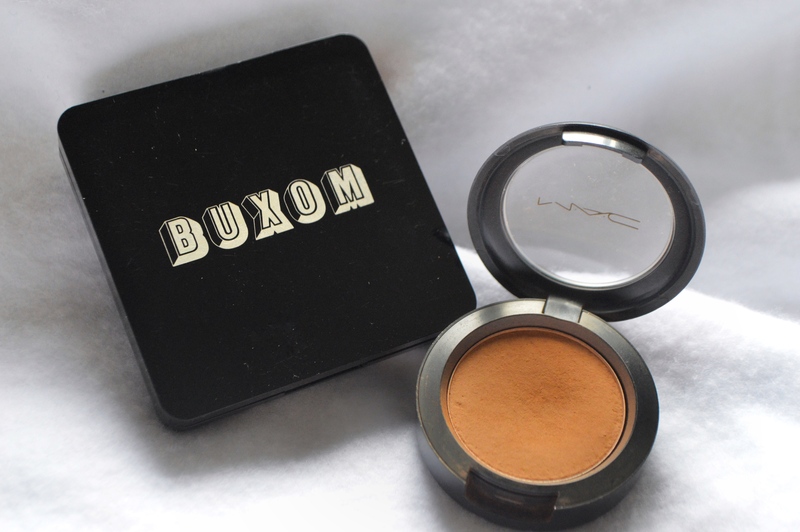 One of my favorite products is the Tahiti bronzer from Buxom, and my favorite eyeshadows to wear every single day of my life is Uninterrupted from Mac. The bronzer on its own gives a really nice soft contour and has a really nice brown tone to it, but I like my contour a little bolder.. Just kidding I like my face extra sculpted and contoured so after I apply Tahiti I go over it with this shadow, keeping it a little more concentrated on the cheek bones for more definition and pop! Since I love the shadow on my eyes for an everyday color, and I know that it will still be natural since its darker than my skin, why wouldn’t I get as much use of out it as possible?!? This lighter golden shade on the left is called Golden Fawn from Makeup Forever and the pinky color next to it is called Morello Cherry. 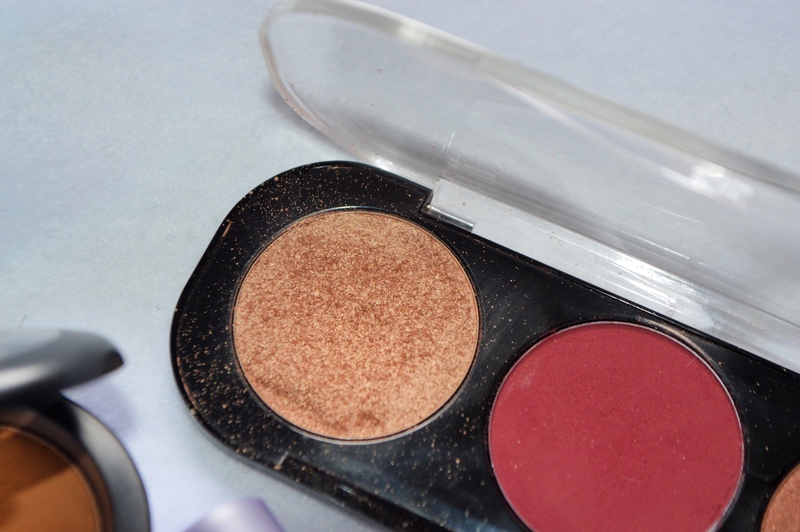 I LOVE these shades and I use them all the time! 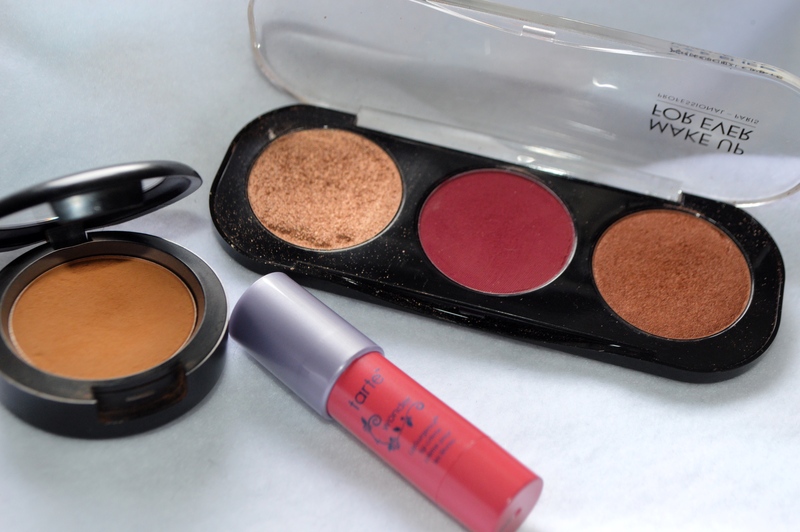 One day (more like everyday) I was running late and didn’t have time to keep digging around in my makeup for eighty-million products so I whipped these on as my highlight and blush and it was a wrap! They became my favorite products not just for the eyes but for my face as well! After that I started suggesting my clients skip the highlighter and use their lighter shimmery eyeshadows as a highlight to save money and time and they’ve been loving it! Also, this trick ties in the other shades you apply together for an even and more monochromatic look! 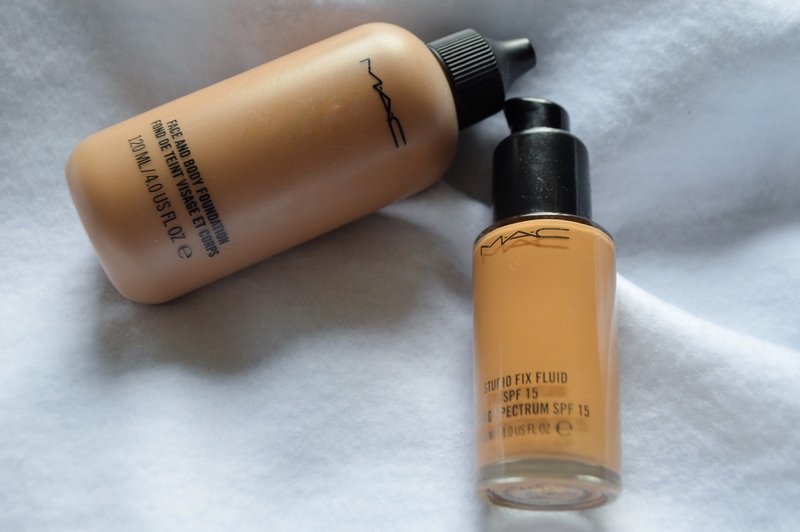 These are my two favorite foundations from Mac. They are completely opposite from one another but I use one or the other,if not both, on almost everyone! The Face and Body foundation is extremely sheer and incredibly hydrating. Its great for mixing with liquid concealers or other foundations to add a little more moisture or give a dewey finish to the skin. I need a little more coverage than the Face and Body gives on its own and I’m also really really oily so, wearing this by itself would leave me feeling greasy and it wouldn’t cover whatever it is I feel like needs covered. The Studio Fix fluid is great if you know how to use a heavier foundation! It has a natural matte finish and oil control in it so it wears nicely on long days or during a bad break out when I need extra coverage. I personally like a lot of glow from my foundation, rather than slap on a ton of highlighter, so mixing about a dime size of the Studio Fix Fluid with just a pinch of the Face and Body creates my perfect foundation for everyday! 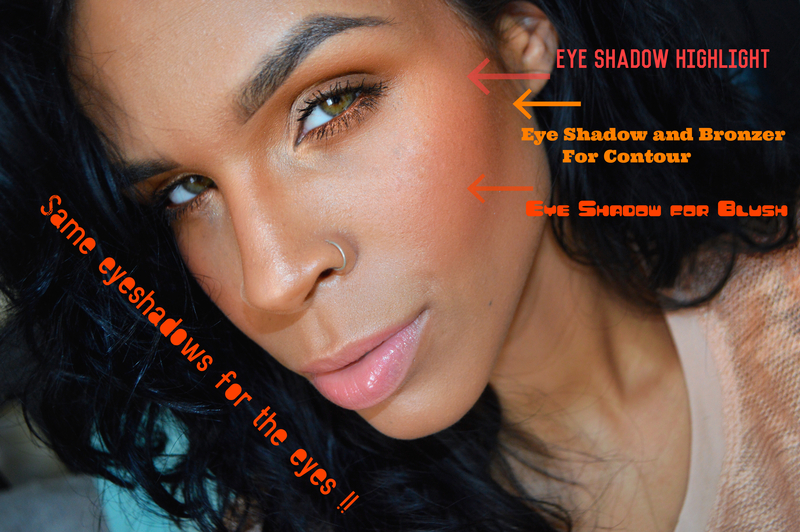 Want to look natural but contoured? Do you want glowy skin but can’t afford an entirely new glow palette just for the cheeks and get all new eyeshadows? Mix and match your products however you want! Play around and see what works for you! you look like a beautiful bronzed goddess!!!! 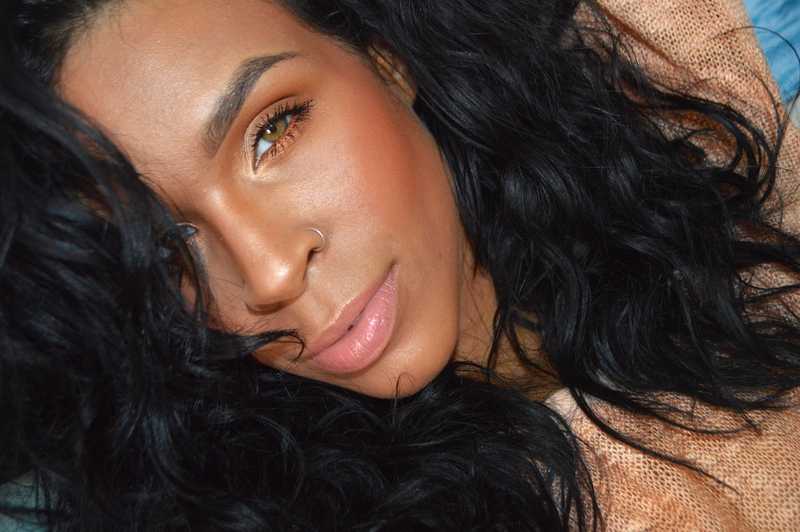 ← Tips And Tricks For Gorgeous Curls!